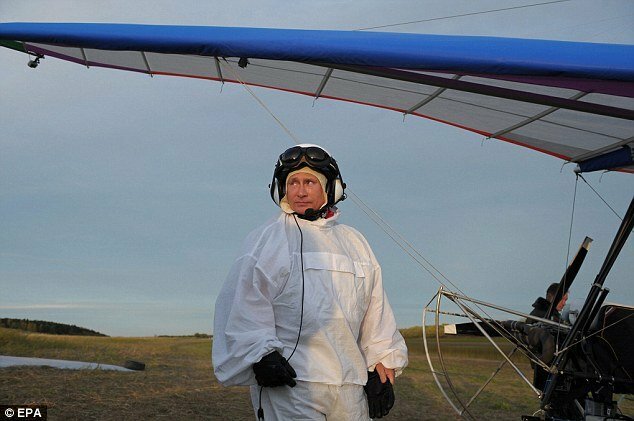 Russian President Vladimir Putin sets off on his latest bid to put right the wrongs of nature by teaching birds to fly. Hang-gliding over Arctic Siberia this week, Vladimir Putin guided white cranes which seem to have lost the instinct to migrate south to a warmer climate for the winter. The aim was to set the endangered birds on course for Asia and as with his previous action-man ventures – which included sedating a tiger, tagging a white whale, and offering tender loving care and a tracking collar to a polar bear – the Kremlin announced total success. As opposition groups and bloggers mercilessly mocked his flying lesson for birds, Putin’s PR machine made clear that after a false start all five juvenile cranes had followed the lead bird – the Russian president dressed in flapping white overalls – and flown for the required distance. It is hoped the cranes will now fly from Kushavet ornithological research station to Tyumen, further south in Siberia, before taking off for middle Asia and a warm winter. “For cranes, the parent is a man in a white robe,” explained Yuri Markin, the director of the game reserve.